Bob Dylan (born Robert Allen Zimmerman; May 24, 1941) is an American singer-songwriter who has been a major figure in music for five decades. Much of his most celebrated work dates from the 1960s when he was an informal chronicler, and an apparently reluctant figurehead, of social unrest. A number of his songs such as "Blowin' in the Wind" and "The Times They Are a-Changin'" became anthems for the US civil rights and anti-war movements. His early lyrics incorporated a variety of political, social and philosophical, as well as literary influences. They defied existing pop music conventions and appealed hugely to the then burgeoning counterculture. Initially inspired by the songs of Woody Guthrie,Robert Johnson,Hank Williams, and the performance styles of Buddy Holly and Little Richard, Dylan has both amplified and personalized musical genres, exploring numerous distinct traditions in American song—from folk, blues and country to gospel, rock and roll, and rockabilly, to English, Scottish, and Irish folk music, embracing even jazz and swing. Since 1994, Dylan has published three books of drawings and paintings, and his work has been exhibited in major art galleries. 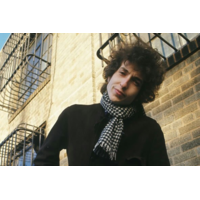 As a songwriter and musician, Dylan has received numerous awards over the years including Grammy, Golden Globe, and Academy Awards; he has been inducted into the Rock and Roll Hall of Fame, Nashville Songwriters Hall of Fame, and Songwriters Hall of Fame. In 2008, a Bob Dylan Pathway was opened in the singer's honor in his birthplace of Duluth, Minnesota. The Pulitzer Prize jury in 2008 awarded him a special citation for "his profound impact on popular music and American culture, marked by lyrical compositions of extraordinary poetic power."